You won't find it listed as a symptom of lupus in any book, but I have an issue that I've found lots of other lupus patients also get. Maybe it's just something the doctors haven't connected to lupus. Or maybe it's just an extension of Brain Fog or joint pain and weakness. 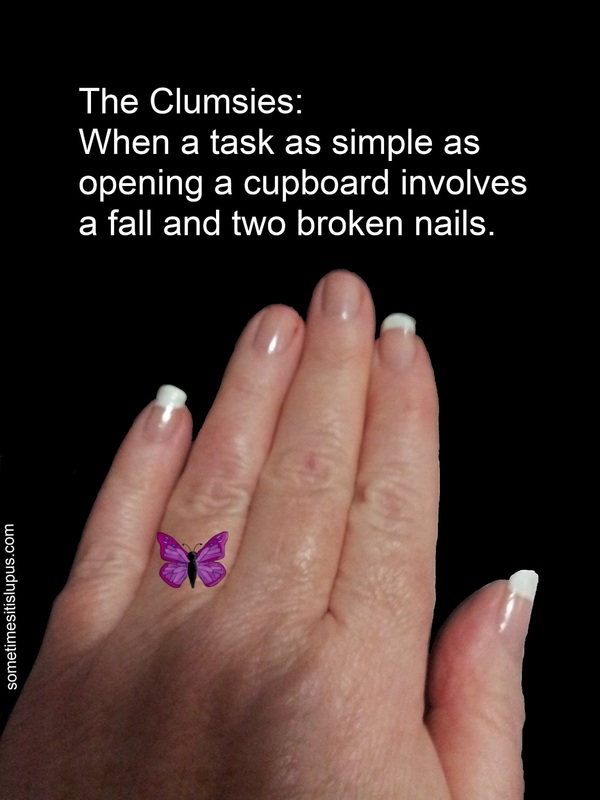 Lots of us seem to suffer from what I call "The Clumsies" or being "Gravitationally Challenged" we walk into things, we fall over, we drop things. I know everyone does these things from time to time. Lupies (some of us at least) do them a lot. A classic example of The Clumsies is last night, I was getting plates out of the kitchen cupboard for dinner. That's a relatively simple task, you might think. I have a history of plates leaping out of the cupboard to attack me, but that didn't happen last night. Last night, it was an entirely new (for me) manifestation of The Clumsies. Last night, I was opening the cupboard, when I lost my balance and fell straight into the cupboard door, snapping two fingernails neatly off. I've never broken a bone, which is good, but breaking two nails by opening a door seemed pretty impressive. Lots of lupies have stories about having encounters with The Clumsies. There are days when it just seems that all inanimate objects are conspiring against us. So far as I'm aware, there is no known solution to the problem. So the only advice I can give to my fellow lupies is: never trust an inanimate object. Inanimate/stationary objects are out to get us. I am sure of it. Thank you for reminding us to look out for these devils in disguise of household items, curbs, trees etc. I am 5'9" tall, but manage to hit my head on a cabinet door in the kitchen that is about 5'11" above. Explain that! I have EDS as well, so trust me, I am not getting up on my toes for any reason let alone to stretch to hit my head. "I fancy there's a mystery to it"